The Premier League’s status as the world’s most popular sports league is underlined by new research by sportingintelligence, published for the first time today, that shows how the League’s income from selling its TV rights in foreign markets puts every other league in the shade. The research is published to coincide with the launch today of a season-long sportingintelligence research project – Premier League: The Global Game – that will seek to explore the true extent of the League’s appeal around the world. Over the course of the 2010-11 season, we hope to recruit at least one “local” fan in every country in the world to share their experiences. More details here if you’d like to join in. We will also be carrying regular features about the phenomenon that is the Premier League, comparing it to other leagues including in other sports, and looking what it can learn itself from elsewhere. The Premier League’s total income from foreign rights deals from 2010-13 inclusive will be £1.437bn, or £479m a year. As our main graphic below shows, that is almost four times as much as Spain’s La Liga earns annually from foreign rights (£132m), more than six times what Serie A earns (£74m), almost 14 times as much as Germany’s Bundesliga earns, and more than 18 times what France’s Ligue 1 earns. Our extensive research has sourced the figures from industry insiders, broadcasters, consultants and / or the leagues themselves. A spokeswoman for the Bundesliga praised the Premier League’s efforts in “building its brand” since it was revamped in 1992, and in “marketing itself so well” globally. The Bundesliga’s own foreign rights’ values are on the up, albeit at a more modest level. They were worth an average of €18m (£14.7m) per season between 2006 and 2009, and €42m (£35m) in 2009-10, and are expected to rise again this season, although as the Bundesliga’s own clubs have not been informed of the value yet, the new figure is not in the public domain. It will still trail the Premier League by a huge way. In Spain, rights deals are done by clubs on an individual basis and the majority of the cash goes to just two clubs, Barcelona and Real Madrid. The domestic and foreign rights negotiations are lumped together. Our figure of £132m is the estimated proportion of TV deals relating to foreign sales from total annual rights deals put at €550m (£450m) per year by Professor Jose Maria Gay of the University of Barcelona, Spain’s foremost football finance expert. The Spanish figures also put the success of the Premier League in some context. The Premier League earns more from foreign rights alone each year now than La Liga earns from all its TV rights. 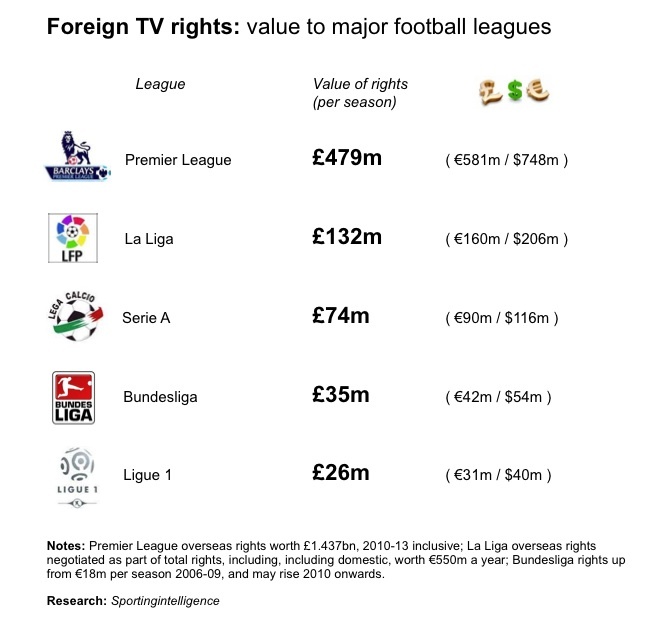 (On top of foreign rights, the Premier League makes around £2bn from domestic rights, including £1.78bn from live domestic rights and the rest from highlights, near-live and multi-media rights). The Premier League’s appeal can be assumed to be partly down to its international cast of players, partly due to canny marketing (the League won the Queen’s Award for enterprise for its foreign rights sales earlier this year), and partly down to the historic global appeal of its “biggest” clubs, namely Manchester United and Liverpool. The rights values have soared because of Pay-TV rivals in bidding wars for premium content, not least in the Middle East, Hong Kong, Singapore and Scandinavia. Premier League games are premium content, overseas as at home. They shift subscriptions. They make money.